Welcome back to another edition of Henshin! Anime. This time, we’ll be looking at Kamen Rider’s animated outing from the early 90s. In the 90s, there was no new Kamen Rider on TV, but the franchise was still around in plenty of forms. There were games, cards, and comics; one of those comics was Kamen Rider SD, the SD standing for “Super Deformed”, an extreme caricature style usually done for comedy. 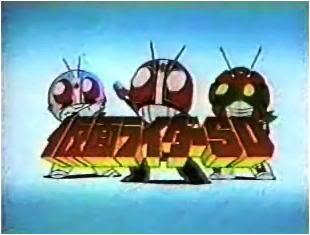 The Kamen Rider SD OVA is based on one of the SD comics, called Kamen Rider SD: Hurricane Legend, and features every Showa Rider in their never ending battle against Gran Shocker and the Great Leader. The Kamen Riders are divided into three groups, Battle Riders, Mechanic Riders, and the Wild Riders. Our heroes are the Battle Riders, with the Mechanic Riders playing a supporting role and the Wild Riders appearing towards the end of the episode. Within the Battle Riders are Rider #1, the consummate professional, the cheeky ZX, and the naïve RX, the star of the episode. There isn’t a lot to the story in this one – a monster, Spider Man, is sent to capture star athletes from all over the world, leaving the Riders to stop his schemes. Standard fare here but this being an SD venture, the story is presented in a wonderfully comedic light. Written by tokusatsu veteran Toshiki Inoue, Kamen Rider SD features a plethora of jokes for both long-time fans and newbies to the franchise. Tokusatsu-inspired anime are an interesting watch but there is an entirely different level of captivation with a series based directly on a tokusatsu series. With Kamen Rider SD, we’re treated to the Rider Machines and arsenal in a wonderfully animated style along with a couple of great fighting moves that you probably wouldn’t be able to pull off in real life. (or an anime aiming for more realism at that) Although it’s not something like the long-running Kamen Rider SPIRITS manga, this is a fantastic watch and I wish there was more to it. The comedy here is cute and quirky, from RX calling Shadow Moon “Sunshine Moon” to a monster being fed up at the Riders not being able to understand the directions to his base, leading to him simply faxing over the route. Kamen Rider SD is a cute quirk in Kamen Rider history that won’t take too much of a bite out of your day should you not enjoy your viewing. There’s action, sometimes silly, sometimes smart comedy, and great early 90s animation going on here. Join us next time when we take a look at the first year of the Saint Seiya revival series, Saint Seiya Omega.